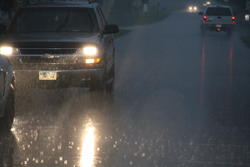 One of the leading complaints from drivers is the inability to see pavement markings under wet night conditions. This issue is a major source of dissatisfaction in state department of transportation (DOT) customer satisfaction surveys. Driving under wet night conditions is stressful and fatiguing for all drivers, but particularly so for the more vulnerable young and older driver age groups. This project focused on the development of a two-year long-line test deck to allow for the evaluation and demonstration of a variety of wet-reflective pavement marking materials and treatments under wet night conditions. Having the opportunity to document the performance of these various products and treatments will assist the Iowa DOT and local agencies in determining when and where the use of these products might be most effective. Performance parameters included durability, presence, retroreflectivity, and wet night visibility. The test sections were located within Story County so that Iowa DOT management and staff, as well as local agencies, could drive these areas and provide input on each product or treatment.